Bharatiya Janata Party MP Savitribai Phule resigned from the primary membership of the party on Thursday, saying the party was playing ‘divisive politics’ and was misusing money to construct temples and statues. 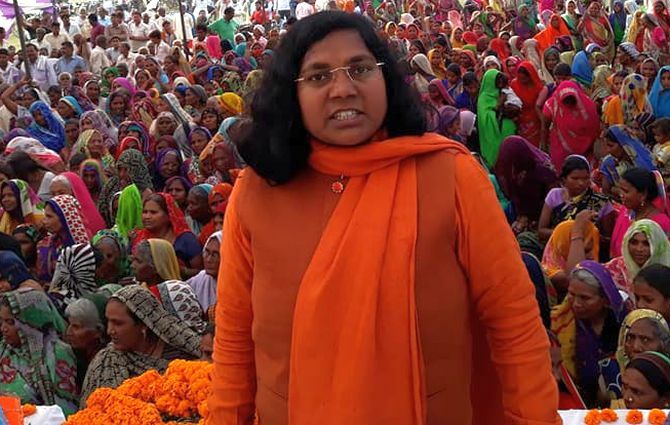 The Dalit MP from Bahraich, Uttar Pradesh, who has long been critical of the party's leadership and resigned from the party on the death anniversary of B R Ambedkar, said she wants to get the Constitution implemented in letter and spirit. "I have resigned from the party. But I will continue as a Lok Sabha member till the end of my tenure," Phule told reporters. Ministers, she added, were making statements against the spirit of the Constitution. "It seems the BJP wants to run the country from Manusmriti and not from the Constitution," Phule asserted, referring to the ancient Hindu code. Phule said she will launch an agitation to champion the cause of Dalits from December 23. On Tuesday, Phule said Lord Hanuman was ‘a Dalit and a slave of 'manuwadi' people’, adding her voice to the row which erupted over UP Chief Minister Yogi Adityanath's statement that the deity was a Dalit. Phule earlier also raised questions on BJP leaders dining at Dalit homes and termed Pakistan founder Muhammad Ali Jinnah, ‘a mahapurush’ (great personality), causing embarrassment to her party.